HUGO BOSS is one of the market leaders in the premium and luxury segment of the global market, who focuses on developing and marketing of premium fashion and accessories for men and women. 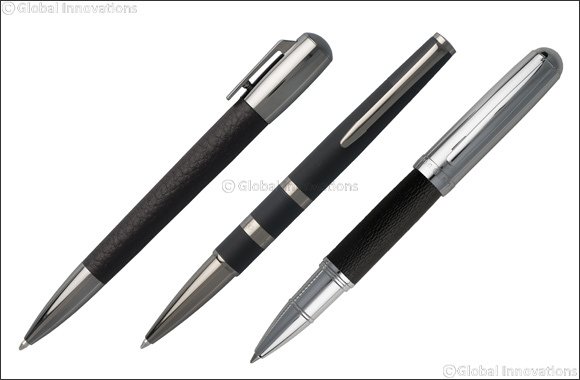 The first collection of HUGO BOSS writing instruments was launched on January 7th, 2015. Today more than 18 impressive product lines are developed in this product category. The core of the latest collection comprises of premium writing instruments such as fountain pens, rollerball pens and ballpoint pens. Minimalistic silhouettes and functional designs sets the collection apart. Designed for the connoisseurs of fine writing, Hugo Boss scripts a tale of fashion that exudes charisma and character. The ‘Arris’ collection is mixing a streamlined shape with graphically striped surfaces. These writing pieces are combining casual modernity and technical functionality while being available in an all chrome or a mix of matte black stripesand dark chrome rings. With a mix of high quality textured leather and crisp chrome metal accents, the ‘Advance’ line is the perfect balance between modernity and sophistication. The ‘Pure ‘line with its tapered yet aerodynamic silhouette redefines modern lines with structural simplicity. These writing pieces are mixing technical precision and an intricate graphic pattern for a tactile writing experience at the intersection of function and design.